A wood burning stove is a sound investment for your home; if used to replace an older style open fire it has the potential to reduce your house’s carbon footprint by at least 14% and will really make the most of wood’s environmentally neutral and renewable energy. Making the decision to replace an existing inefficient appliance or to install a stove from scratch into your living space can feel daunting but there are plenty of options to choose from. This page will provide you with an explanation of the features you may wish to consider when choosing the right wood burning stove for your home. Today, wood burning stoves are available in many different shapes, styles and sizes. 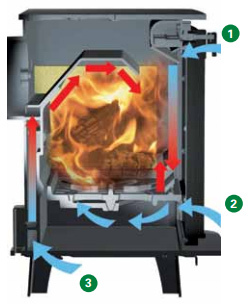 The exact format for each Stovax stove is given on individual product pages but, in most cases, some or all of the following features will be included: an Air wash system for the window; a Clean burn system with secondary air; an External air facility and an integral boiler to provide domestic hot water and run radiators. One of your first steps (once your home has been assessed by a professional installer) is to decide what size of stove is right. As a guide, we suggest that for every 14 cubic metres of space, you will need 1kW (approximately) of heat output in order to achieve a room temperature of 21 degrees. However, this figure will give only a rough guide and does not take into account a number of other important factors such as the age of your home and how well insulated it is; how many rooms are to be heated or whether or not your living space is open plan. 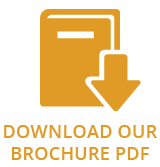 You may also require that your wood burner provides your home’s hot water needs and there are certainly many boiler stoves to choose from in today’s market. • Do you wish the stove to heat water as well as the room? • Are Clean burn, Air wash and efficiency important to you? • Do you wish to burn wood in a Smoke Control Area? All these aspects should be carefully considered before you make your investment but a Stovax retailer will be able to lead you through the options to ensure you choose a stove that will not only be a welcoming and warming feature in your home but a real asset to your heating system. Stovax has a nationwide network of dealers, many with stoves burning live in their showrooms so you can get a real impression of the final effect. A Stovax retailer will also be able to recommend trusted local installers for a professional fit so you can relax and enjoy the many benefits of owning a wood burning stove. Wood burns best on a bed of ash with its combustion air coming from above, so wood burning only versions of stoves have a flat fuel bed and no ash pan. Multi-fuel stoves usually have a riddling grate for the effective combustion of solid mineral fuels but also have Airwash so they can effectively burn wood as well. The riddling grate allows the ash and cinders from smokeless fuels, anthracite or peat/turf briquettes to be riddled into an ash pan, maintaining the primary airflow through the fuel bed and, hence, creating the optimum conditions for efficient combustion of those particular fuels. According to the model, a Stovax multi-fuel stove may have either an internal or externally controlled system for riddling the grate. This is the air that is drawn into the wood burning stove, typically at a low level to maintain the combustion of the solid fuel being burnt. Usually, the primary air enters through a control on the front of the stove. The control can be adjusted to regulate the amount of air entering the firebox, thus giving you the opportunity to determine the intensity of the fire. This, in turn, will alter the heat output. Primary air is the best way of controlling a stove burning solid mineral fuels and may also be used to start a wood fire. However, primary air is not normally used in a log fire once the logs are burning well. Air wash is a specific design feature that uses a specially placed vent or vents to draw in cool air from the room; the air is then heated and ducted to ‘wash’ over the inside of the glass. This feature helps to keep the glass clean for longer, allowing you to enjoy the glow and flames to the full. Where a Stovax wood burning stove includes a convection system, cool air from within the room is drawn into the convection chamber and then heated as it rises within the stove before flowing out into the room. The hot air rising draws more cool air into the stove, setting up a continuous flow and maintaining added heating efficiency. Some Stovax stoves also have the option of an electrically operated fan to boost the convection process and provide a quicker warm-up time within your room. Air wash air is drawn down over the inside of the window to keep the glass clean and clear. It is also used as primary combustion air when burning wood. 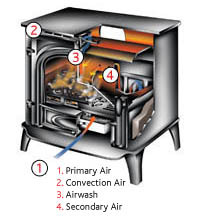 Clean burn secondary air is pre-heated as it passes through a heat exchanger chamber within the firebox. It is then drawn into the smoke stream, where it combusts unburnt hydrocarbons to provide a cleaner burn and greater thermal efficiency. Introducing pre-heated, secondary air into the firebox at just the right point promotes efficient combustion of any unburnt hydrocarbons that may be in the smoke. This ‘clean burn’ process can greatly increase the combustion efficiency of your wood burning stove and dramatically reduce the amount of unburnt particles going up the chimney.This can in turn reduce your servicing costs and save you money in fuel. It also gives you an improved flame visual. Stovax High Output Boiler stoves are specifically designed to provide domestic hot water and/or run radiators as part of a stand-alone system. The number and size of radiators you can operate will depend on the ‘heat output to water’ of the particular model. Alternatively, you can ‘link up’ some boiler stoves with your existing heating system. The ‘link up’ system can connect with gas or oil sealed heating systems, combi boilers, underfloor heating, advanced electronic controls and solar panels. This will help you to save money on fossil fuels and reduce your reliance on single-source heating. In both cases, it is strongly recommended that you explain your requirements to an experienced stove retailer and/or heating engineer. This exemption is given only to appliances that have been independently tested to demonstrate particularly clean burning combustion. Without this exemption, you may only burn smokeless fuels in a multi-fuel stove within a Smoke Control Area. Stovax has one of the most comprehensive choices of stoves for use in Smoke Control Areas.